The Blue Ribbon Brides Collection by various is a perfect collection of Christian historical romantic tales. There are nine unique stories in this single volume. Each one is totally absorbing, wonderfully told and each has the feel-good factor. It’s a fabulous read and I can highly recommend it. Requilted With Love by Carrie Fancett Pagels is a wonderful feel-good story to kick off the collection. Carrie Fancett Pagels always writes stories that speak straight to the readers heart. Her talent for describing scenes means the reader walks through the story actively rather than passively reading it. The story deals with loss and grief and second chances. God is at the very heart. Characters need to seek His guidance and listen to His voice. 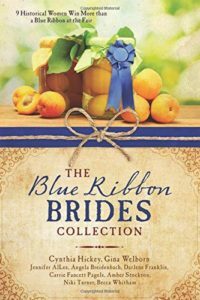 Seven Medals And A Bride by Angela Breidenbach is a sweet story about surrendering to God’s plans. Sometimes we try to push things through in our own strength. We need to let go and trust that God will work all things together for good. The story shows how belief in God and science are not mutually exclusive. Education and science can be used to improve the lot of people. The story has a social conscience. We need to all work together for the improvement of all. A Taste Of Honey by Darlene Franklin is a wonderful tale about harvesting the goods that God has provided. There is much beauty in nature. The story is also about community. People pulling together to help others. Altered Hearts by Gina Welborn shows how God gives us all dreams. The story explores what happens when your dreams become your goal, your raison d’etre. When your dreams become more important than listening to God. The tale also explores what it means to be a Christian. Some people believe being a Christian means you will have a trouble free life. Nothing could be further from the truth but God has promised to never leave us nor forsake us. We have a faithful God not a prosperity gospel. Another delightful tale with a wise message. Better With Butter by Jennifer Allee is a sweet story about forgiveness and friendship. A little encouragement goes a long way. Love and loyalty abound. And over it all stands God who has plans for each and every one of us. Feuding families have offspring that fall in love. Very reminiscent of Romeo And Juliet. There is the theme of loss and guilt which ties in with forgiveness. Forgiving others is hard. Forgiving yourself feels impossible. The story is set against the backdrop of World War I. Images and experiences mean returning soldiers have both physical and mental scars. The condition known as shell shock was only just beginning to be recognised. A delightful tale of steadfast love. First Comes Pie by Niki Turner is a delicious offering of apple pie in this tale of forgiveness and second chances. Recipes for apple pie are included too. The story focuses on the command to take care of the widows and orphans, with references to gleaning at the edges of the field. It also shows the results of poor choices. Situations tear at both the characters and readers heartstrings. Everyone deserves a second chance. A wonderful love story too. Front Page Love by Tiffany Amber Stockton is a delightful account of the annual fair where dreams can come true. Everyone has dreams and plans but the best are those belonging to God. Loved ones and friends encourage hopes and dreams. A fabulous small town feel to the story and a welcoming atmosphere. Competing Hearts by Cynthia Hickey is a wonderful story of love, friendship and community. A place where dreams can be achieved if one surrenders ones plans to God. The community where everyone helps each other. They don’t have much but what they have, they share. A perfectly wonderful collection of stories that will leave you feeling good about love and life and people and God. Thanks so much Julia for the delightful review!!! I always love to read what you have to say!!! God bless and keep you my U.K. Friend! Oops I dk how my name got changed to that typo!